The Appello X – A(105N)/(121)AX is the next generation of user recordable alarm sounder capable of storing up to 2 minutes of content. The Appello X… records, stores and plays back with unsurpassed clarity, user defined voice messages, music or sounds stored directly to non-volatile memory. – Electric tone and voice sounder. – Records, stores and plays back user defined voice messages. – Sound Output: Tone Max = 110dB @1m (A105NAX), 126dB @1m (A121AX); Voice Max = 101dB @1m (A105NAX), 111dB @1m (A121AX). – Sound Frequency: 4 tone stages, 45 tones (see pdf attached for full tone list); stage 4 tone always = tone 29. – No. messages: 4 x 30s (total of 120 seconds). – High voice and music reproduction quality. – Independent volume control for tone and messages. – For multiple installations it is necessary to record messages only once on a master unit. 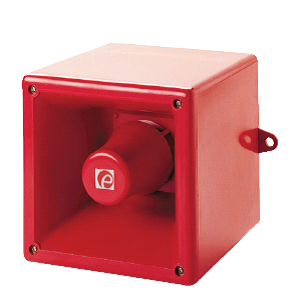 – Optional LED beacon; For beacon specifacations see L101H (LED). – Cable Entry: 2 x M20 knockouts. 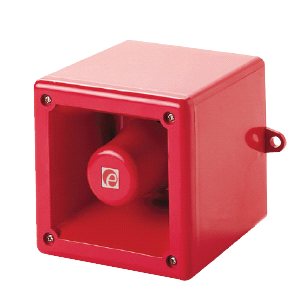 – Also available in D aluminium housing see D105 & D112. – Lens Colours Available: Amber, Blue, Clear, Green, Red. ESS2010NAPX A105NAX Appello, 10-30VDC, 256mA @ 24VDC. ESS2030NAPX A105NAX Appello, 90-260VAC, 124mA @ 230VAC. ESS5012APX A121AX Appello, 14-30VDC, 1.51A @ 24VDC. ESS5031APX A121AX Appello, 90-260VAC, 517mA. ESS2110NAPX AL105NAX Appello with LED beacon, 10-30VDC, 413mA @ 24VDC, (specify colour). ESS2130NAPX AL105NAX Appello with LED beacon, 90-260VAC, 159mA @ 230VAC, (specify colour). ESS5112APX AL121AX Appello with LED beacon, 14-30VDC, 1.67A @ 24VDC, (specify colour). ESS5131APX AL121AX Appello with LED beacon, 90-260VAC, 567mA, (specify colour).